We also carry a full line of replacement parts that look and work as well as your original equipment. 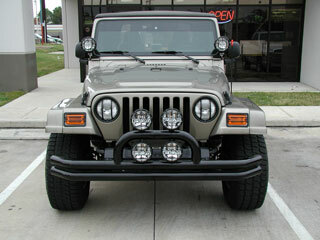 Our Jeep accessories are designed to help you get the most from your on and off road requirements. Replacement soft tops for your Jeep can provide added durability and visibility during your time behind the wheel. Plastic windows and rugged vinyl-coated cloth can provide protection from the elements while maintaining the low weight profile of your Jeep for added fuel economy and improved off-road capability. Jeep hard tops can provide increased protection against outdoor weather conditions and offer better protection in the event of an accident, making them a good choice for drivers who spend a considerable amount of time on the highway. Protecting yourself against injury in the event of a rollover or collision should be at the top of your list of priorities when taking your Jeep for a spin. Roll bars and cages are an ideal way to ensure greater safety inside your passenger compartment and to maintain your Jeep’s integrity if you are involved in an accident. These sturdy, solid steel Houston truck accessories are your best defense in a rollover and can reduce damage to your Jeep in roadway accidents as well. Roof racks, bike racks, and tie downs can provide much needed storage and cargo space for your Jeep. Roof racks are ideal for luggage, ski gear, and other oversized items that will not fit easily into your passenger compartment. Bikes can easily be stored and transported on bike racks designed to fit your model of Jeep. Tie-down equipment allows you to secure your cargo to these racks and provides added security on bumpy roads or at higher speeds. Designed to hold your spare tire in place outside your Jeep for easier access, spare tire carriers attach permanently to your vehicle and can enhance the appearance of your vehicle in a functional way. Spacers can allow clearance between your Jeep and your spare tire of one inch or more to create a more attractive profile on and off the road. Houston truck lift kits, oversized tires, and enhanced shocks can allow you to experience true off-road maneuverability on rough and rocky terrain. We can help you select the most practical and useful off-road accessories for your Jeep. By considering your clearance requirements and budgetary constraints, you can enjoy the ultimate in off-road performance while ensuring that you stay street-legal for everyday driving activities. We carry a full line of Houston truck bars and racks designed specifically for your Jeep and offer you the best prices on quality components. By customizing your Jeep to suit your specific needs, you can get the most enjoyment on and off-road.